Becoming a Wayfinder Educator isn’t just about learning a new curriculum — it means developing your role as a mentor for your students and deepening your awareness of your own purpose journey. Consequently, it is vital that any educator who wishes to teach the Wayfinder Toolkit completes at least two days of training with our experienced Wayfinder Guides. We offer three training options to suit your needs. If you are interested in becoming a Wayfinder Partner School, hosting an On-Site Training is the best option for you. 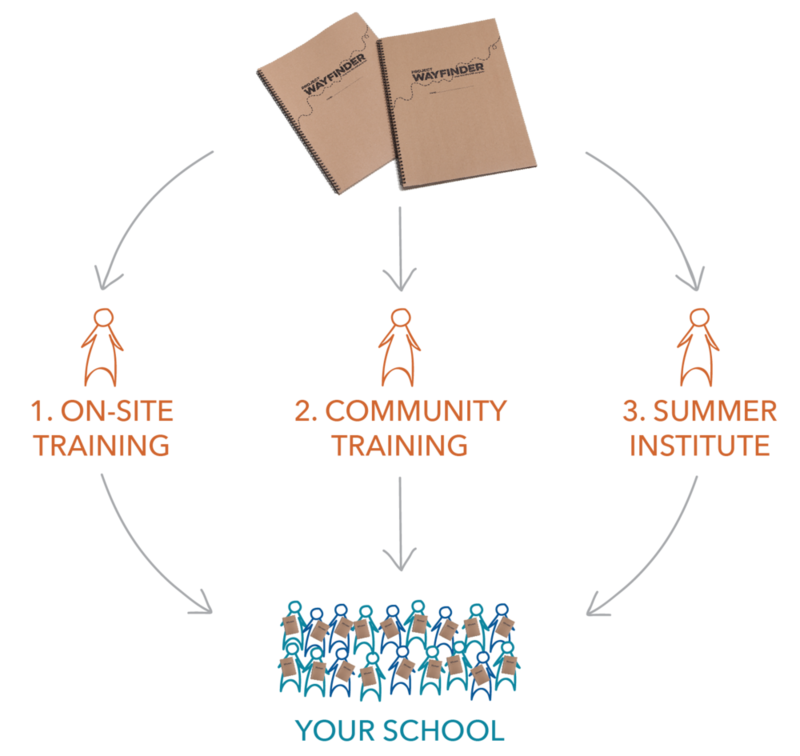 On-Site Trainings are ideal for schools/programs that have 8 or more educators who will be teaching the Wayfinder Toolkit. Learn more about booking an On-Site Training here. If you are interested in bringing Project Wayfinder to your area but do not have enough educators to book an On-Site Training, you can host a Multi-School Training at your school and invite other schools to join from your area. Learn more about organizing a Multi-School Training here. Our 4-day Summer Institutes are a great way to explore Project Wayfinder in more depth and meet other schools working on purpose learning. This is the best option for small groups educators who want to start by prototyping Wayfinder at their school, or individual educators who want to teach the toolkit in their classroom. Learn more about our Summer Institutes here.